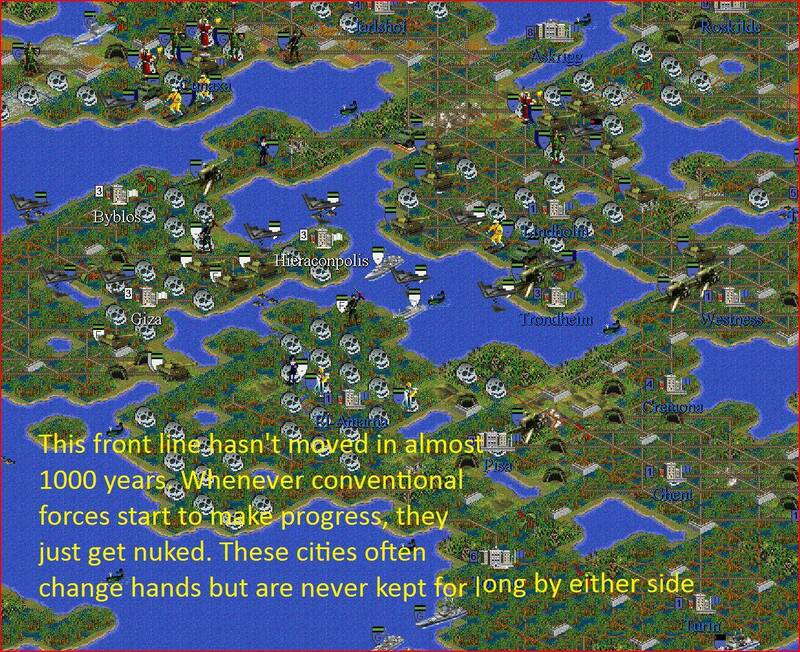 I've been playing the same game of Civilization II for almost 10 years. This is the result. I've been playing the same game of Civ II for 10 years. Though long outdated, I grew fascinated with this particular game because by the time Civ III was released, I was already well into the distant future. I then thought that it might be interesting to see just how far into the future I could get and see what the ramifications would be. Naturally I play other games and have a life, but I often return to this game when I'm not doing anything and carry on. The results are as follows. In truth, Anarchy is the lack of government due to either a revolution or the collapse of the previous government due to discontented citizens. While no government is in existence, no taxes are collected, no science research is conducted, and no progress is put into either City Improvements or Wonders of the World. If you can, try and stay away from this form of government. And if you're going to be switching government types often, attempt to get the Statue of Liberty wonder. What follows is a raw log of the 02/07/97 Online Chat with Sid Meier. An HTML version will be produced shortly. Fri Feb* 7 20:04:07 1997: Paul says, "Welcome everybody!" Fri Feb* 7 20:04:30 1997: Paul says, "Allow me to introduce Sid Meier. A man I'm sure who requires little introduction to this crowd." Fri Feb* 7 20:04:32 1997: Paul says, ""
Fri Feb* 7 20:04:40 1997: Paul says, "Welcome Sid." Fri Feb* 7 20:04:52 1997: Sid says, "Thanks, great to be here." Fri Feb* 7 20:05:35 1997: Paul says, "tell us what you are up to. " Fri Feb* 7 20:06:08 1997: Sid says, "Well, since last May I've been working at Firaxis Software..."